In the Aude, Cathar country, old stone barn (55m2) with a terrace, renovated in charming loft type cottage, very comfortable and functional, for 2 people, with a magnificent view of the Cathar castle Peyrepertuse, in a small authentic village and preserved Corbières, with a grocery store. Comfortable bedding in 160. Mix of stones, wood and contemporary style. Terrace. Air conditioning, heating and wood stove design. The river passes at the foot of the village and allows you to bathe in a very nice natural setting, opposite the Cathar castle of Peyrepertuse. Very nice hikes to the approximately. Very well placed to visit the Cathar country. The ground floor (35 m2) is composed of a large living room, loft type with a fully equipped kitchen, a dining room and a living room (sofa bed 130cm), with a wood stove, as well as a travertine marble bathroom with a bathtub and heated towel rail. Upstairs, a large air-conditioned room (20 m2) with a bed of 160cm and good quality bedding, with a bay window overlooking a stone terrace, facing south (16 m2). 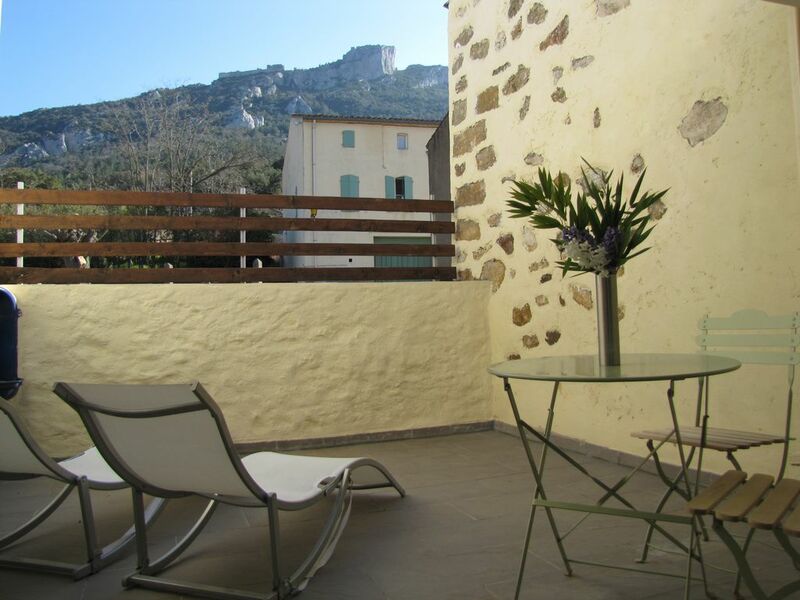 The terrace has a beautiful view of the castle Peyrepertuse and has two chairs and a table with two chairs. Nous avons été pleinement satisfaits de notre séjour dans cet appartement agencé avec goût. La mezzanine avec terrasse donnant sur le château de Peyreterpuse constitue un espace d'enchantement. Une hôte accommodante dans les horaires d'accueil et de départ qui nous a évité tout stress dans nos déplacements. Nous recommandons vivement cet hébergement. Une caution de 300 € est demandé au vacancier sur place, à son arrivée. Ménage fin de séjour OBLIGATOIRE : 40 €, à régler sur place.